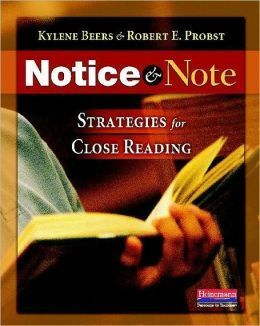 I will be teaming up with some bloggy buddies to lead an online book study on Notice and Note: Strategies for Close Reading by Kylene Beers and Robert E. Probst. This book is all about teaching students to respond to complex texts during independent reading.This practical text offers model lessons to use that help readers understand and respond to character development, conflict, point of view, and theme. The postings will start on June 3 and continue through the middle of July. I will post a schedule later next month. I hope by giving you advance notice that you'll have time to order the book and get started reading.